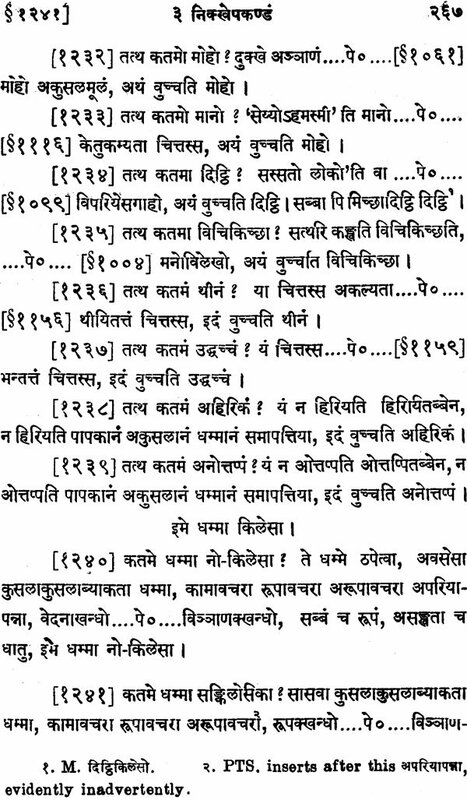 Dhammasangani and its Commentary Atthasalini are often prescribed by the University of Bombay at the higher examinations like B.A. (Honours) and M.A. for the students of Pali. These students are always handicapped not only for the want of Devanagari editions but also for the want of really good critical editions of these books. Sinhalese, Burmese or Siamese books are often found to be a stumbling-block on account of a script wholly foreign to Indian students. The Pali Text Society published the editions of these texts as early as 1885 and 1897, but in spite of the efforts of the Editor, Dr. Edward Muller, the texts- the latter of which, especially, is at several places hopeless-are not satisfactory. So we have undertaken the work of critically editing these texts in Devanagari characters, and we are now giving the first of these, the Dhammasangani. As the numbers prefixed to the paragraphs in the edition of the Pali Text Society are often referred to by scholars in their individual works, or in standard journals, or in reference books, we thought it better to adopt the same with as little change as possible, although, in not a few places, it is found that, on the one hand, a fresh number has been put where it is not needed, and on the other, it has not been put where it is really needed, In preparing our text, we have consulted (i) the Sinhalese edition prepared by M. Devananda and K. Pannasena, printed in the Mahabodhi Press and published in the Buddha Era 2454 (1911 .A.D. ); (ii) Burmese edition printed in the Zabu Meit Swe Press, Rangoon, 1937; (iii) Siamese edition - printed by the Siamese Government in Buddha Era 2473 (1930 A.D.); (iv) Pali Text Society's edition by Edward Muller; and (v) a Sinhalese manuscript kindly lent to us, through the Bhandarkar Oriental Research Institute, Poona, by the authorities of the Theosophical Society's Library at Adyar, Madras. The manuscript secured from Adyar Library is written on palmyra leaves (23.2" x 3.2") in Sinhalese script and this text is put along with two other works, Puggala-pannatti and Dhatukatha, in one and the same volume. The text of the Dhammasangani covers 96 folios, all but the first and the last being written on both sides. Each page has generally nine lines with the exception of a few like pages 68 where we have ten. The manuscript does not seem to be written by one scribe as, from folio 80 onwards, we find a new and more graceful hand-writing. This manuscript, however, was not found to be very reliable as, on several occasions, we discovered that the scribe was jumping over passages- no doubt due to the frequent repetitions of words and paragraphs- or was repeating them. As the special feature of this book, we may bring to the notice of the readers not only the critical nature of the book, revealed by the various important readings, given from other editions of the text as well as from the Commentary, and by the brief explanatory footnotes, often containing elucidative passages from the Commentary, but also the attempt in tracing the original passages abbreviated in later paragraphs and giving the reference to the same. The difficulty of exactly locating the original passages, especially when they differ but slightly from other similar passages, those alone who have an experience of such work can realize. 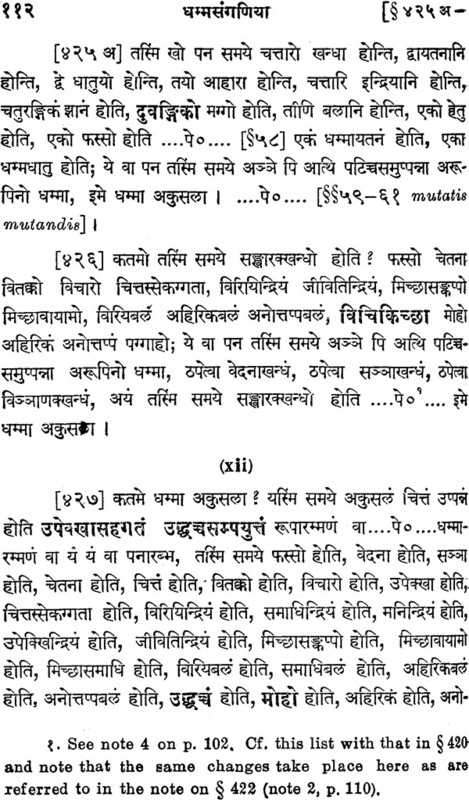 Important words in paragraphs as well as the whole of the matika at the beginning of the book, and at the beginning of the rupakanda are printed in black type. A few typographical as well as other errors have crept in spite of the vigilance of the editors. Readers are, therefore, requested to get them corrected as indicated in the list of Corrections and Additions given at the end of the book. The Editors have also in mind, as indicated above, to commence the printing as soon as funds are available, of a similar critical edition of the Atthasalini. They hope the Government, University Authorities, princely Merchants, Rajahs and Maharajahs will appreciate the importance of such works and encourage the editors in continuing the selfless and self-imposed task of making available to the Indian readers critical editions, in Devanagari characters, of valuable Pali works which are indispensable for a thorough understanding of the evolution of thought in Ancient India. We cannot forget the help of sevesal gentlemen who rendered all the assistance that we needed in bringing out this edition. We have to thank Mr. M. K. Walunjkar (now B.A.). our former student at the Fergusson College, for helping us in collating the text; and Mr. N. V. Tungar, Teacher of Pali and Sanskrit in the New English School, Poona, for helping us in preparing the list of Corrections and for making available to us the copy, in Devanagari characters, of the text which, we understand, was prepared by Mr. Soman of the Sabarmati Ashram in 1923-24, while he was studying at the Gujrat Vidyapitha, Ahmadabad. It was secured through Prof. D. Kosambi, This copy, though it needed a thorough revision and editing, was of such great use to us that it served the purpose of the Press-copy for a larger part of the text. We cannot adequately thank Prof. Dharmananda Kosambi, the veteran Pali Scholar, whom we approached for guidance at several naughty passages in the text He was always kind and ever ready to help us with his suggestions. We have also to thank our colleague, Dr. V. V. Gokhale, B.A., Ph.D., for going through the Introduction and making some valuable suggestions. And lastly, we have to acknowledge our indebtedness to the University of Bombay for the substantial financial help it has granted towards the cost of the publication of this work. The Pali Canonial literature consists of the three Pitakas or Baskets, or Collections-the Vinayapitaka, the Suttapitaka, and the Abhidhammapitaka. The Vinayapitaka gives the rules and regulations for the Buddhist monks and nuns. 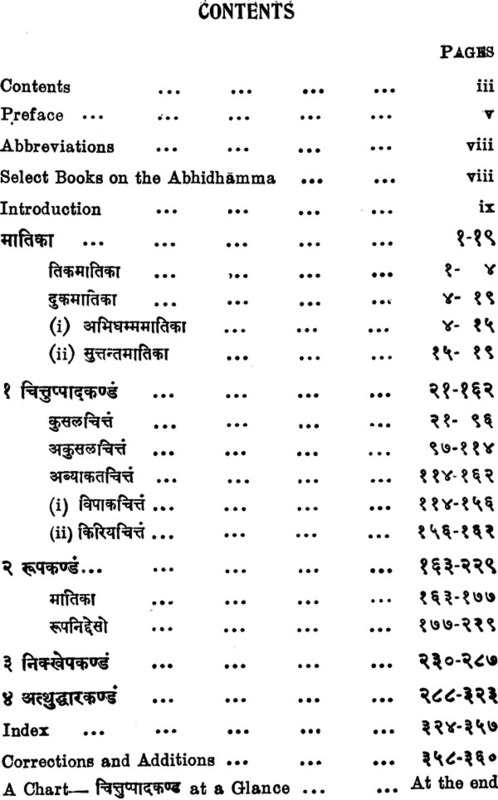 The Suttapitaka gives in a popular form the teachings of the Buddha and the Abhidhainmapitaka treats the same subject in a scholastic and highly technical manner, The prefix 'abhi' in the word 'Abhidhamma' is used in the sense of 'higher' but it refers rather to the mode of treatment like the nippariyaya-desana (absolute anti unqualified manner of the statement), than to the nature of the contents themselves. Like the Theravada School of the Buddhists, prevalent in the Southern countries of Asia like Ceylon, Burma, Siam, Cambodia, the Sarvastivada School of the Buddhists, once very prominent in India, also claims an Abhidharmapitaka, But this latter has only a few things in common with the Abhidhammapitaka of the Theravadis such as (i) the number 'seven' of the books that go to make up that Collection, (ii) the topics in the chapters of the Dharma- skandha agreeing with those in several chapters of the Vibhanga (iii) the method of treatment in the second part of the Dhatukaya resembling that in the Dhatukatha, and (iv) the scholastic method of reasoning, together with the arguments and phraseology, employed in the Vijnanakaya offering striking resemblance to that in the Kathavatthu. All modern soholars agree that the Abhidhammapitaka represents a much later literary development than the other two Pitakas. The orthodox view, represented in the Commentary on the Dhammasangaui (PP. 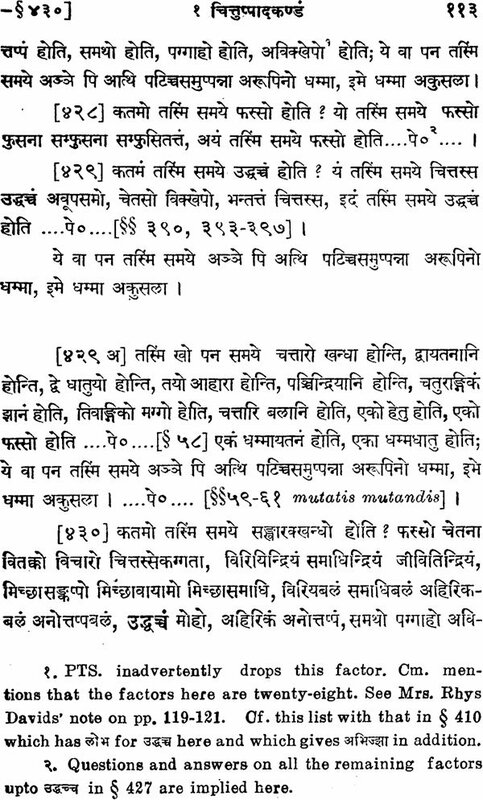 15-16), that 'the Abhidhammapitaka was first preached, in the abode of Tavatimsa gods, by the Buddha primarily to his mother who had already departed there, and then it was repeated by him, on the banks of the Anotatta Lake, to Sariputta who in turn taught the same to his colleagues in holy life' can no longer be considered as more than a mythological tale in these critical days of the twentieth century. That Kathavatthu, the fifth of the seven books of the Abhidhamma, originated at the time of the Third Council of Pataliputta or Patna, which was held in the reign of Emperor Asoka by the middle of the third century B. C., has been admitted even by tradition. Atthasalini records of the Dissenters who refused to give the sanctity of the Sacred Books believed to be originating with the Buddha, to the Kathavatthu, Hence it may be said that like the other Collections, the Abhidhammapitaka also gradually grew and that it was the result of literary efforts of a community rather than that of one or more single individuals. We may not be far from truth if we say that the first four books of the Abhidhamma, Dhammasangani, Vibhanga, Dhatukatha, Puggalapannatti, were probably redacted a few decades earlier and the last two, Yamaka and Patthana, a few decades later than the Third Council of Pataliputta. The Abhidhamma is a totality of the psychological and philosophical teachings of Buddhism. In it, we find the 'philosophy of mind (psychology and logic) and philosophy of conduct or ethics'. It treats of 'realities i.e., of psychical and physical phenomena which alone may be rightly called realities, though only of momentary duration, arising and passing away every moment'. Dhammasanganl, the first book of the Abhidhamma pitaka, gives us an inquiry into such phenomena. It gives, from the point of view of psychological ethics, an analysis of 'what we find within us, around us and what we aspire to find. It does necessarily include the analysis of mind, the cataloguing of mental states in the visible as well as the invisible-but to the Buddhists as real as visible-worlds, including those in the various stages on the Path leading to the Buddhist ideal of Arhatship. It also treats of the visible form in all its different aspects, to be more concrete, it tells us of manifold types of consciousness that may be styled as moral, immoral, and unmoral, i.e. neither-moral-nor-Immoral and of the different factors that are associated with the minds in those varying conditions. 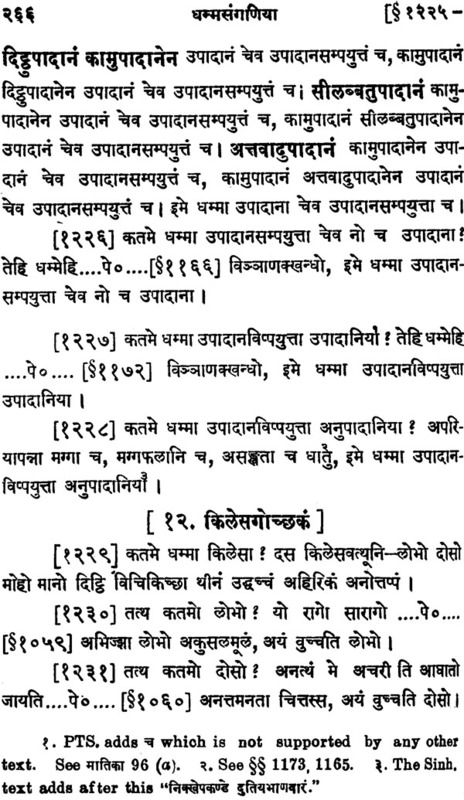 It also gives a detailed analysis of the mental condition of a Buddhist aspirant trying to attain, with all its travails, the various exercises of meditation, or to reach the Four Stages on the Path of the Buddhist ideal of Arhatship; or of one who is enjoying the fruition of the attainment of those various exercises or stages. It also analyses for us the mental conditions of the Arhats whose actions-may be in the Plane of Desire or of Form or in the Formless-bear no fruit. The Buddhist aspirant has to desist from evil, accumulate good and purify his own mind by definite exercises of meditation or certain defined ways of thinking. To achieve this, he must have a thorough knowledge of the phenomena that may be sty leg moral, immoral, or unmoral, the triad which is mentioned as the very first in the and to a detailed explanation of which the first two divisions of the text are devoted. This text, however, does not claim to be a treatise giving a systematic representation of its subject to a beginner. It pre-supposes knowledge of the subject and only claims to be a Manual for Advanced Students.